As March is Women’s History Month, Cambridge University Press is proud to launch its “Women in Science” series. 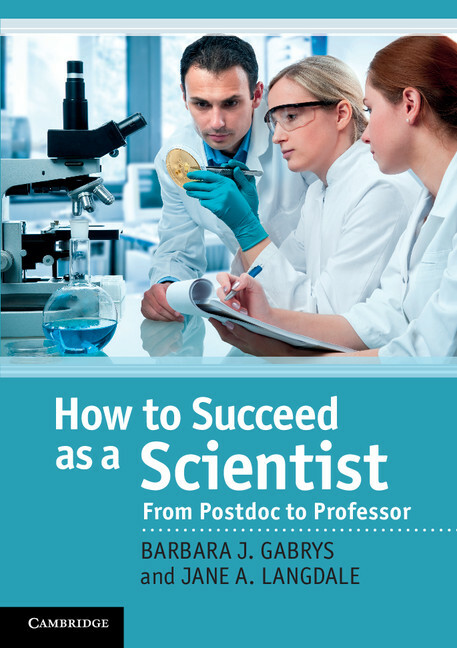 For the inaugural post, we asked Dr. Barbara Gabrys, co-author of How to Succeed as a Scientist, to offer her advice on how to cultivate a successful, rewarding career. This quote, from one of referees of the book proposal, says it all – that’s why Jane and I bothered to write this book. My personal journeys through the snakes and ladders of a career in the sciences could have been smoother if I had a good idea what it is all about. Having moved through three countries and worked at several universities, I wish I would have been armed with some key tools. A lot of material which made it to this book would already have been useful at a PhD stage. Everybody assumes you know what your supervisor wants, and how to do it; even more so when you become a postdoc. Then you are like a medieval journeyman, travelling from one master to another to hone your skills until finally becoming a master. This would be fine if we had years to learn and copy the master’s skills. In reality, time is short, and pressures on achieving results and publishing in respectable journals are high. Hence, in How to Succeed as a Scientist, we have put together an essential toolkit which will enable you to get a job done (whether that’s writing, presenting, teaching—to mention just a few). Then we list more resources that we have found helpful for deepening your understanding and mastering a given task. How to get a permanent position. In getting permanent position, an often overlooked factor is the knowledge of the group/department/institution, and your projected place in it on the long term time scale. Would your research be strengthening the existing one, or would you be bringing different expertise, with the view of expansion into a completely new area? Both have their merit – it pays off to do spy-like search: at least you will impress the interview panel! How to get money to support your research. While there is no guarantee to get money for your research, there is one thing you can do: Discuss your draft with people you trust, both in your field, other scientists, and the proverbial grandmother. This will ready the product for submission based on the insights of referees who may have expertise outside your chosen field. How to be a successful and inspiring group leader. If you want to be an inspiring group leader you can do just one thing: Maintain your people’s motivation and make sure there is a good social connectedness in your group. If you care how others are doing, and can instill this in other members of the group, the rest will follow. There is fierce competition for positions where transferable skills are asked for, which are going to make a difference between a success and failure. While the book is focused on academic careers we have not forgotten about other careers, in industry, government or other institutions. Our book is intended as a handy guidebook – so keep it close to hand at your desk!